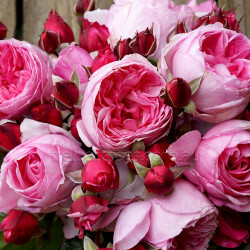 (Kornagelio) - A classic combination of a fully petalled blooms with a strong lemon / green apple fragrance. 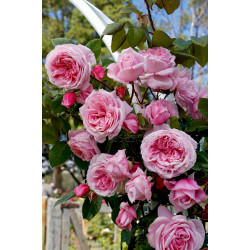 The large blooms are on average 9 cm across with a good stem length for cutting and framed by dark green foliage. A vigorous climber with the health of a Kordes’ rose. This climber has it all! Approx 2m spread. Fragrance: This rose presents a fresh top note of freshly ground lemon peel completed by a fresh green apple scent. The scent is underlined by a discreet impression of aromatic myrrh in the bottom note. Maximum fragrance: in the morning & evening.